Change is a certainty on the human journey. This volume is an invitation to finding life's purpose on that journey. 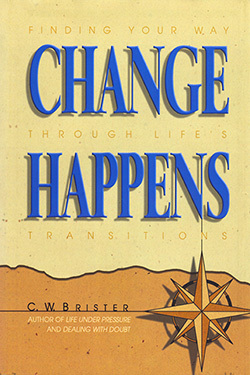 The author uses testimonies of various people about managing transitions and weaves them into a meaningful tapestry for readers to draw a map for their own pilgrimage. He examines the reasons for change and its cost with the purpose of helping readers build a meaningful vocation, healthy relationships, and a hopeful future. C.W. Brister is Distinguished Professor of Pastoral Ministry at Southwestern Baptist Theological Seminary in Fort Worth, Texas. He is the author of Life Under Pressure and Dealing With Doubt. Dr. Brister invites readers to face life's wake-up calls as spiritual challenges. His inspiring stories will help you find your way through life's transitions with faith, courage, and wisdom. You'll be wiser for reading it."